The Wisdom of Crowds | Blah! 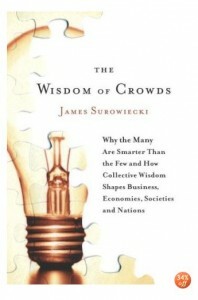 Finally, after a year of carrying it around in my bag and half starting it, I just finished reading James Surowiecki’s The Wisdom of Crowds. I have to say, I found this one of the most interesting books I’ve read in a long time. Basically, this is an introduction to the concepts of collective decision making — colloquially knowns as “the wisdom of crowds” — the idea that groups of people can make better decisions than the individuals within the group. Surowiecki gives a number of examples of this phenomenon, some that are truly amazing. The canonical example is at a fair in England. A hog was being raffled to the person that could most accurately guess the weight of the hog. Some of the people guessing were, of course, farmers that raised hogs, but many of the people were just regular fair-goers who had no real clue (I mean, seriously, how many of us could guess?). It turns out that the average guess was much better than nearly any individual guess. The errors of guesses by less expert people go on both sides of the right answer, giving a good overall estimate. This is just one example of this phenomenon. These ideas have become more formalized in recent years – for example by Scott Page and others — with a solid mathematical foundation. Surowiecki doesn’t go into this foundation, rather introducing the importance of the concepts. But, he does discuss the implications of collective decision making in companies and corporations, small working groups, government, and several other aspects of life. These ideas have led to the creation of decision markets, in which people effectively trade “stocks” on the answers to questions such as who will win a given election or which drug should a drug company persue for development. The best known example of such a market is the stock market, though it isn’t a perfect market, for reasons discussed in the book. To me, the most interesting part was when he was discussing management of corporations. He discusses how corporations are more successful when everyone within the corporation has some stake in decision making, when decisions aren’t top-down from upper management. He also points out that bonuses for executives tied to certain deliverables lead to deception on the part of the executives, as they either overplay how hard the deliverables are to meet or just out-right deceive, cooking books or what not to meet expectations. It seems that, in many places, management is actually moving the opposite direction. I think all managers should be required to read this book. I am really intrigued by these ideas and really trying to figure out a way to include them in my work. Not just in how I interact with people, but just more generally. We’ll see if I can come up with anything useful. I would highly recommend this book to anyone that deals with groups of people. The insights into how people work as part of a group are invaluable and, in many cases, counterintuitive. Not only would it help people understand better how to interact in part of such groups, but it would also help to best create those groups in the first place. The key, if I got the point correctly, is effectively cognitive diversity — diversity in how people think. Even people who aren’t expert in the relevant area, as long as they have some knowledge, even if they are not the smartest people in the group, add significantly to the group and make the group smarter overall. The lessons in this book are wide ranging and would impact many aspects of life. I can’t emphasize enough how much I think anyone involved in management or decision making should be familiar with the ideas presented here. I highly recommend this book. For a summary of some of the ideas presented, take a look at this Wikipedia page.